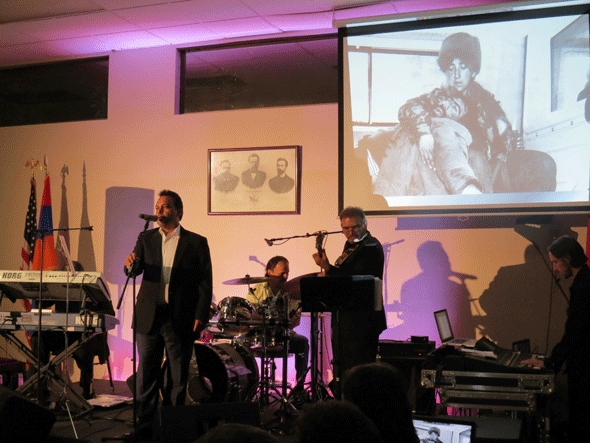 Armenians gathered in solidarity at a Revolutionary Song Night dinner on Saturday, August 18th at the Pasadena Armenian Center to fundraise for AYFs With Our Soldiers Campaign. With the Central Executive declaring this year as the Year of the Azadamardig, the event was one of many to assist veterans of the Artsakh War with necessary medical treatments. Twenty Azadamardigs have been treated so far, with their ailments ranging from the need for eye prosthetics and hearing aids to surgeries to remove shrapnel still within their bodies decades after the war. Over 150 people were in attendance, and donations were being gathered throughout the night as Viken Yacoubian performed revolutionary songs. The AYF reached out to the community and received overwhelming support from local ARF, ARS, and AYF chapters. Individual supporters and their families also donated, enabling more aid to reach the war veterans in need of medical care. Over thirty thousand dollars was raised. This event showed that our community stands with the AYF in supporting our freedom fighters. We thank them for that support and we are confident that together, we can make the lives of at least a few dozen of our Azadamardigs better, says AYF Central Executive Chairman David Arakelyan. It is the bureaucracy in Armenia which prevents veterans from receiving any sort of aid from the institutions meant to provide such support to the freedom fighters. Veterans need volumes of supporting paperwork, which is difficult to obtain since many of them never filed the proper claims to receive an official status of a freedom fighter back in early 90s. Even for those veterans who have their documents in order, the government assistance is so insignificant compared to their needs and so difficult to obtain that many simply choose not to pursue it. This leaves the wounded and suffering Azadamardigs to fend for themselves and attempt to provide for their families. An important factor in dedicating this year to the freedom fighters is the need to raise awareness about their problems and to make this issue a focal point for the Armenian society, both in the Diaspora and in the Homeland. Hopefully, the With Our Soldiers initiative will bring greater attention to the issues faced by our freedom fighters and force the Armenian government to do more in resolving these problems, states Arakelyan. For more information about the WOS campaign and further efforts to aid veterans of the Artsakh war, visit www.WithOurSoldiers.com. Though three hundred and eighty miles away from Central Executive headquarters, the AYF Phoenix Kedashen chapter is spreading awareness of the With Our Soldiers campaign and raising funds. On August 25th the chapter hosted a dinner inviting community members to learn about and donate to efforts by the AYF in assisting veterans of the Artsakh War receive critical medical treatment. The Phoenix community rallied together and made donations to the campaign which will have a significant impact on the lives of dozens of Azadamardigs. Thus far, twenty Azadamardigs have been treated whose conditions range from the need for eye prosthetics and hearing aids to surgeries to remove shrapnel. The treatment of Azadmardigs has been documented and made into an informational video. The video depicts the lives of the Azadamardigs and their struggles in obtaining medical care. The With Our Soldiers campaign is focused on bringing attention to these issues and forcing the Armenian government to resolve these problems. 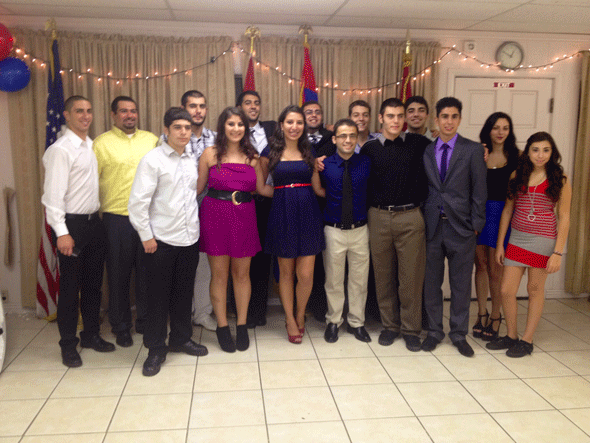 “The AYF chapters, both in Greater Los Angeles and in distant areas like Phoenix, have been instrumental in raising both funds and awareness about the Azadamardik campaign. Their contribution to this cause is significant, and we are very grateful for the work they have done, ” says Central Executive Chairperson David Arakelyan. 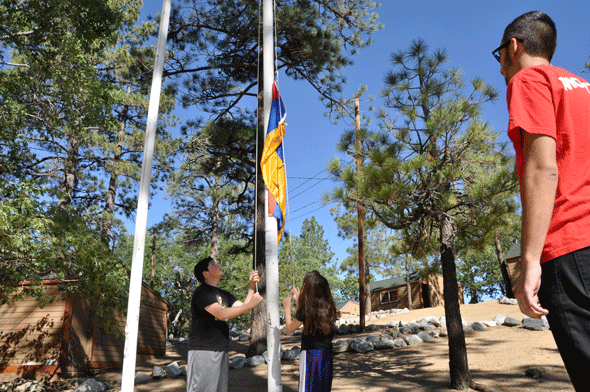 The Armenian Youth Federation’s Glendale “Roupen” Chapter hosted their first Annual Camp Kef uniting three generations of Armenians under the Armenian Revolutionary Federation umbrella. Held June 16th through the 18th at AYF Camp, members of both the Shant and Zavarian Juniors joined the AYF Roupen and the Aharonian members for an eventful, educational and memorable weekend. 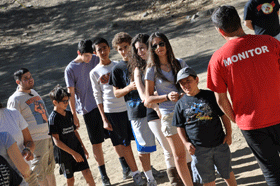 Below, the Manoukian family reflects on their experience at camp together. On Friday, we arrived when it was completely dark. I was so excited for camp that I had no plans of falling asleep that night! I was also worried that my parents, both gomideh members, were going to ruin the weekend. They had promised not to be annoying and to be nothing other than another Unger and Ungerouhi to my sister and I. We arrived, emptied our luggage, and that was the moment it began. That moment continued until I was in the car on the way back to Los Angeles. I socialized with my friends and, to my amazement so did my parents. At this moment I was (in Armenian terms) abshadz. I realized they were not kidding when they said they were my unger and ungerouhi, and not my parents. We badanees settled into our cabins, played some games, and went to sleep. We woke up and, to our amazement it was not morning. We were given a mission, to guard our camp against unwanted intruders. This night was not so interesting. My cabin woke up early, played some basketball, and joined the group for flag pole and exercise. We ate breakfast (which was delicious), and so the Kef began. We hiked to a nearby lake and played. They told us there was goin g to be an educational, and everyone believed the Kef  was too good to be true. The lecture was about Hye Tahd, the Armenian Cause. This lecture was very rare in the sense that it enagaged the group and didnt bore them. We then gathered back at camp to play my longtime favorite game, steal the bacon. This game consists of two teams being separated of equal distance and a central point with a person wearing a hat. The objective of the game is to get the hat. We were separated into red, blue, and orange, and had an exciting game. We moved on to our next agenda, quiz bowl. Everyone had the same feeling, that the Kef was too good to be true. Again, to our amazement, this was not the case, with the quiz bowl being very fun. We ate lunch and moved on to our next activity. The day went by too fast. As the activities continued, we looked forward to the nights festivities. After flag ceremony and dinner, the badanees were starting to get tired. This was however completely reversed when we had wacky olympics, a series of silly games where teams compete. We were very excited. We then were assigned our duties as guards, and the whole chapter was on their toes. We soon heard a whistle that started a game known as hartsagoom, where a group of people attacks the grounds trying to take something, mainly our flag. We cared for that flag, the piece of cloth, the Yerakouyn. We did everything we could to protect it. There was even a point where an 8-year-old was protecting the flag side by side with our director, who wrapped his entire body around the flag. I had an epiphany, I realized we were individuals acting as a group, protecting Hye Tahd. We were Tashnagtsutyun. That night we ate kebob, and went to bed. The next morning, we did our usual routine, but it was fathers day. I went up to my father to wish him a happy fathers day, but I couldnt because for the time being he was only my unger. We said our goodbyes, and headed home. That moment, was a pool of emotions: enjoyment, sadness, perseverance, determination, pride, and belonging to a higher cause. I realized the value of family, and gave thanks that I have one. 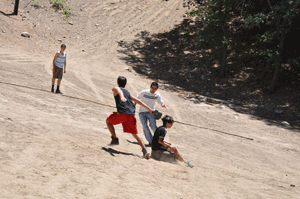 This camp was not a camp where the Armenian spirit was instilled; it was a camp where that spirit was strengthened. It was my first time going to Camp Kef. It was a funny risk taking adventure. It was really fun. The minute I put a foot in the campground, I started to laugh. We were faced with a hardzagoom in the middle of the night, played wacky Olympics, steal the bacon, quiz bowl, basketball, hiked to Jackson lake, had a water fight and our group, the orange group, was declared the winner at the end of camp. It was the first time that I was in a hardzagoom. Glendales Shant & Zavarian ungers, and the AYF-agans were at war. The gousagtsagans were standing there taking pictures. We battled against AYFs Valley Sardarabad chapter. We were bahags all night and I was thrilled about it. Our AYF members kept testing us if we paid any attention and if we were able to become brave warriors. During the hartsagoom, being the youngest girl didnt stop me from sitting on the captured & helping the AYF-agans gain control by pouring ice cold water on their faces. This is exactly what we are all about. The Glendale chapters are like a family. If one falls down, then the rest help the person get back up and fight. We dont let each other down. If someone was not able to get the hardzakogh, then another Glendale-agan would tackle them down. 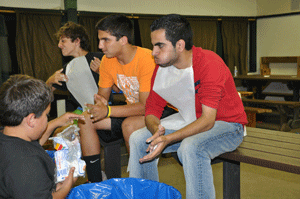 At the end of the day Valley & Glendale shook hands and went up to the lodge to have kebob & sing patriotic songs. I am very proud to be called a Glendale member because I wouldnt be the good brave person that I am. At the end of the camp, I learned that no matter how tall or how big the opponent is, if you are confident, brave, and like a family, you would win any challenge that you face, no matter how hard it is. I wouldnt be as motivated and brave, if it werent for my friends. We should have camps like Camp Kef more often. It seemed like it was only yesterday when my friends from ARFs Zavarian Badanegan & I, would gather at the AYF Camp Big Pines lodge during the badanegan seminars and discuss various issues amongst ourselves. For example we would evaluate the April 24th march from Montebellos Holy Cross Church to the Armenian Genocide Memorial at the Bicknell park. We would share stories of how wed surround the Henchakian partys youth group carrying red-blue-red flag of soviet Armenia with the hammer & sickle on upper left corner with the real symbol of our homeland, the Yeragouyn. It seemed like it was yesterday, that in the same lodge, we would have our Asbarez Nights talking about our fedayees, the Garegin Nejdehs, Andraniks, Gevork Chavoushs, Soghomon Tehlirians & Arshavir Shiragians. Shortly, we would proceed to talk about those who were considered the new fedayees of the Nor-orya Azgayin Azadagragan Baykar at the time: The Hrair Gilindjians, Hampig Sasounians, Levon Berberians, Vartges Der Garabedians, Rafi Elbakians, Grigor Levonians, the Lisbon 5, the LA 5 & many more freedom fighters who had sacrificed their lives for the liberation struggle of our nation. We would then wrap up the evening singing patriotic. It seemed like it was yesterday, that as Dashnagtsagan badanees we would dream of singing the Mer Hayrenik as our national anthem, or see the Armenian flag fly proudly next to the more than 190 United Nations member flags. Fast forward 27-28 years. June 16th, 2012. I found myself sitting in the same lodge, starring at my teenage son & daughter, who as badanees, were sitting in the same area where I had sat decades ago. 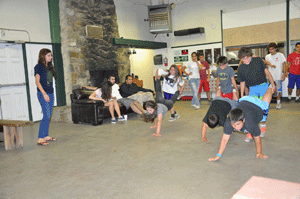 The AYF Glendales Roupen Chapter had organized a weekend getaway at AYF Camp Big Pines called Camp Kef, bringing together generations of Dashnagtsagan Ungers, ranging from 8-58 years old. In other words, they had tried to bridge our past with our future. When I first walked into the grounds, the only thing I could recognize were the cabins locations, the flagpole, & the suicide hill . Other than that, everything had changed. The arts & crafts cabin was now this beautiful state of the art playroom with multiple game tables for all ages. The pool was actually sparkling clean blue, far from the pool I remembered with shades of green. Inside the cabins, the mildew smell was gone & the bunk beds had what looked like great new mattresses. Even the restrooms were nothing like I could remember. And to top it all off, there was a basketball court. Kudos to all camp committee members, management, volunteers, donors, & sponsors who throughout the years had brought such drastic changes to our campsite and made it this beautiful modern yet traditional in spirit campground that it is. he gave me the wrong password. He said garodadz-missing-instead of Garod, the name of our fedayee, so we took him down. What seemed an innocent, cute and amusing story, coming from an 8 year old who hardly spoke Armenian well enough to distinguish Garod & garodadz, to me, was a reminder of something I had long forgotten about: the 1st basic principle of the ARF-Dashnaktsutyuns strategy: the source of ARFs strength is its ideology, its organizational structure, its individual members commitment, its historical past and the Armenian people. Throughout the day, I got to kick it with my new ungers and got to know a group of amazing, devoted, bright, young individuals who are by every sense the true revolutionaries. The true progressive thinkers who hadnt just memorized a few songs or slogans, rather passionately believed in the values and principles of ARF and its mission. I saw that burning flame inside them, the desire to fight the darkness & prevail as the knight in shining armor, saving our nation from the disaster it is headed to with its corruption & unjust leadership who lack national values. The day was filled with great activities such as Quiz Bowl, Steal the bacon, hike to Jackson Lake, where there was a short educational on Hye Tad- followed by wacky olympics, khrakhjank, & last but not least Asbarez night. us pack boxes wearing their infamous light blue t-shirts with the writing Kal Dari Van in the back. I saw how we would find ourselves in front of the old Asbarez building on Colorado on Tuesday mornings around 7:30 -8:00, to see if there was any news from homeland. We had no google, no internet, no smart phones. As a matter of fact land lines wouldnt even work in Armenia. I saw how my fellow badanee ungers & I would hop in the bus to San Francisco to demand Karabagh during Gorbachevs visit after spending the night on the sidewalks of Shrine auditorium protesting the presence of the red army in Armenia during Red Armys Song & Dance Performers visit or drive all the way to Wyoming to form a protest line on the roads that Shevarnadzeh was due to pass thru. I saw myself standing on top of a truck in the middle of Yerevans Republic Square on August 24, 1990, on my 21st birthday with a 10 lbs VHS camera documenting one of the most historical moments of our Nations history, the raising of our tricolor flag, OUR Yeragouyn, on top of the Government building while the Philharmonic Orchestra played the Mer Hayrenik. It was not just the flag that was returning home, it was us, the Armenian nation, our national values, our ideology, our struggle, the tapestry of our beings. It was what only us, the Dashnagtsagans had kept sacred for seven decades outside our homeland. It was the Holy Grail of the Armenian Nation. I saw Armenias Independence, I saw the dark & cold days that I would spend in Armenia where drinking water was at time a luxury. I saw the 8-10 hour long trips from Yerevan to Zangezoor. I saw how we, as a party returned home and I saw the liberation of Shushi & rebuilding of our homeland. I saw many faces that I can no longer see these days. I saw friends, leaders, old & new. I saw joy & disappointment; I saw ideological & national values that had kept us going for decades, taken over by personal greed & weaknesses of some of my fellow ungers. As much as I saw parallels in my younger days with that of my childrens, there was something that I found that was missing in me. The burning fire within, that fueled me and thousands like myself to do what we can for our cause, for our ideology. The fire that would fuel each and every one of us to make the impossible possible. My thoughts were interrupted when the AYF ungers started asking some questions and having discussions. The questions they asked, their suggested solutions that had deeply rooted national values, their progressive approach reminded me what the Dashnagtsutun is all about. Only if we could execute the letter & spirit of our bylaws, only if we could remember people & leaders come & go, but the ideology and basic principles can never change. And as Garegin Nejdeh, the founder of AYF once said himself: When the sons value the national ideology higher than their fathers words, when the sons defy their fathers for what will bring victory to our people, thats when we, as a nation, will march victorious having accomplishments that the human eyes are yet to see. Thank you Roupen chapter for allowing me to re-live my youth & rekindle the fire within that was long out. Thank you for teaching me such valuable lessons. And thank you for being different, being daring, being vocal, being progressive, and being everything that my generation has long forgotten. One size does not fit all. Likewise, one’s way of life will not resemble another’s. This reality hit me rather quickly upon getting on the airplane toward Armenia. I can list a million grievances I have with people’s behavior out here, but in return, the list is quite lengthy from their viewpoint toward us. Stripping yourself of all judgments is a necessity in order to be able to truly discover what this land and people are about. Yet, you need to take it a step further and make yourself humble, accept the way of life you experience as you travel throughout the country, and do all you can to not impose your way of life on the rotating wheel of customs and culture out here. This is the starting point for change. The people will listen to you if they accept you. Otherwise, you are a circus clown to poke fun at and bring entertainment to a rather bored audience. I’m so proud of our Youth Corps group when it comes down to their behavior and attitude throughout the four weeks of camp we’ve had so far. We were literally slapped in the face by various cultural norms as we worked together with the kids, the local Yeridasartats Tashnagtsootyun members, and the various city locals we came across. It was especially shocking because our group is almost entirely made up of girls, and the locals love to put pressure on the behavior of women. In the end, we gained their respect in return and planted the seeds we came to sow. Choosing your battles is a must. It adds flavor to foreign relationships, and it allows concrete ideals to shine. I have grown and expanded as an individual, and I have helped my brothers and sisters in the motherland do the same. There’s a lot of beauty to be discovered in the cultural chaos of Diaspora-Armenia relations, and we can only have a say with programs like Youth Corps that put you in the heart of our meshing Armenian reality. Five camps was a great success this year, now let’s expand.